Newport Beach honors one of the city’s most famous former resident and boater. NEWPORT BEACH ― John Wayne’s life, as a local resident and boater, is being honored with two exhibits in Newport Beach. Presented by John Wayne Enterprises, both exhibits opened on his birthday, May 26, and continue through Labor Day. The Balboa Island Museum is exhibiting “John Wayne: At Home in SoCal.” Photographs and memorabilia are on display of his life in Newport Beach including images of his waterfront home and his private yacht, Wild Goose. This 136-foot boat was transformed from a World War II minesweeper to John Wayne’s own private yacht. 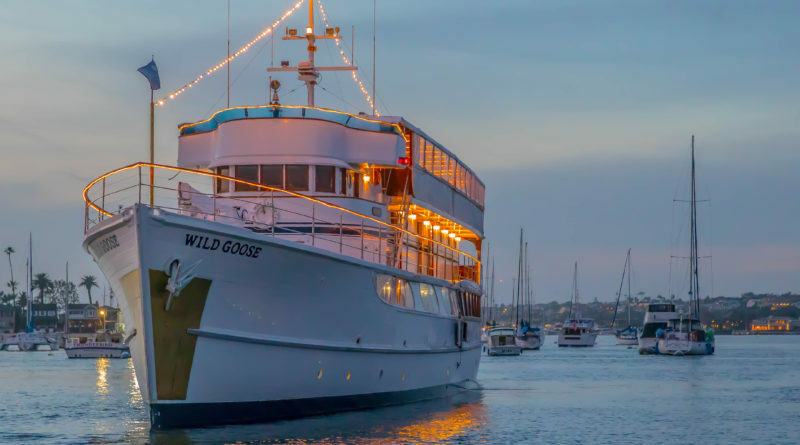 Wild Goose remains in Newport Beach to this day. Currently operated by Hornblower Cruises and Events, the yacht can be booked for private events. The Newport Beach Central Library also has an exhibit. “John Wayne – On Set with the Duke” showcases 15 prints by photographer John R. Hamilton. These photographs of John Wayne on the set of various films are being shown for the first time. Amy Shepherd and Laurie Kratochvil, curators for the show, will hold a presentation to discuss these photos on June 10 at 2 p.m. in the Central Library Friends Room. The City of Newport Beach recently dedicated a local park by renaming it John Wayne Park. The park, formerly named Ensign View Park, is located at 2501 Cliff Drive in Newport Beach. John Wayne’s gravesite is at Corona del Mar’s Pacific View Memorial Park. He would have turned 110 this year.